​​Fine wine, food, paint & canvas are included for a truly unique and enjoyable evening for a date or, a group of friends. Never painted before? No worries. Artist Barry Treu will guide you to a finished painting that you'll be happy to hang at home. 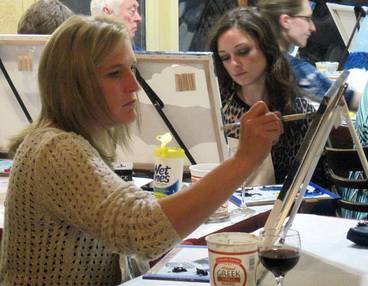 The evening begins with wine and painting at 6 pm. At 7:15 there's a break for dinner and after that we put the final touches on our masterpieces, finishing around 9 pm. If you receive a message that the event is full then use the contact page to send an email with your name and contact information and you will be put on the waiting list. Full refunds are given until 5:00 pm on the Thursday before the event. A $20.00 fee is retained for cancellation after Friday. There are no refunds for cancellations the day of the event. appetizers, pizzas, and salads provided by Cannova's Italian restaurant. A fine selection of house wines is available from the beginning through dinner. After that it's back to add the finishing touches to your masterpiece! or as a group and list the names of those sitting together. This will be a good one for couples! If you want to receive advanced notice emails contact me here and I will put you on the list. Get in touch with me if you would like to arrange a private party. We can do them at your home, Cannova's, or another venue.